Infosys, the software giant from India — which incidentally is the largest exporter of IT workforce to the U.S. — will be creating 10,000 jobs in America for Americans over the next two years. This comes on the back of President Trump's crackdown on H-1B visas that is restricting tech companies to hire from abroad. 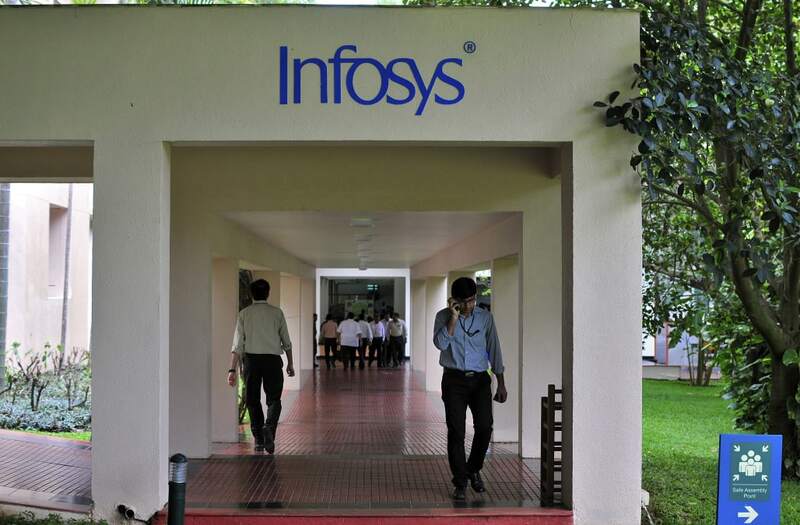 Infosys will also be opening four technology centers in the country, starting with one this August in Indiana, Reutersreports. India hogs close to 70 percent of all H-1B visas issued annually. Infosys this year has applied for 1,000 of them. And that is a substantial decrease from last year's 6,500. Its CEO Vishal Sikka told Reuters, "When you think about it from a U.S. point of view, obviously creating more American jobs and opportunities is a good thing." Stocks related to the financial services industry continue to flourish during the Trump presidency. Ameriprise, an asset management company that has been around since 1894, is just one financial service enjoying the ride. In fact, Ameriprise stocks are nudging up toward prices not seen since February 2015. As of March 10, the stock was at $133.56, less than $5 off from its all-time high of $138.26 set back in February 2015. Ameriprise's stocks dwindled as low as $86.76 in the days preceding the election. The day after Trump's election, the stock soared to $102, a 17 percent increase. Since Trump moved into the White House, Ameriprise is among stocks that continue to rise. With cutting-edge high-tech products ranging from smartphones to smartwatches, it isn't any surprise that Apple has seen a steady but sometimes bumpy climb since its inception in 1976. The company traded at more than $130 per share in July 2015, but declining sales dropped its stock to just over $90 by May 2016. Investor Warren Buffett's company, Berkshire Hathaway, made a $1.1 million investment into Apple shares in May 2016. But the real boost in Apple stock didn't come until after Trump took office in January of this year. Apple shares were at $120 on Jan. 20. By March 1, they rocketed to an all-time high of $139.79, a more than 16 percent increase over that time period. Apple might or might not be a good investment now. So do your homework before you buy. "Investors seeking to buy stocks at present should be certain that they can stay invested for the long term," Friedberg said. "Stocks are expensive in comparison with historical valuations, which implies that future growth in stock prices will likely be tepid for the next few years." On Aug. 18 of last year, the U.S. Department of Justice announced its intention to phase out use of privately operated prisons. Soon after, The GEO Group's stock dropped sharply. The company manages 104 detention and correctional facilities worldwide, with more than 87,500 beds among them. Trump's election win on Nov. 8 reversed the stock's downward trend. By end of business on Nov. 9, GEO's stock jumped more than 21 percent. By the time Trump took office, The GEO Group's stock price was 23 percent higher than it was before the Aug. 18 announcement. The stock hit an all-time high of $48.97 on Feb. 27, one day after Attorney General Jeffrey Sessions released a memorandum reversing the Aug. 18, 2016, order. Although Goodyear Tire and Rubber stock isn't at an all-time high, it is flourishing under the Trump administration. The stock is the highest it has been since 1999. Goodyear's stock price peaked at $75.75 on Jan. 1, 1998, the year Goodyear celebrated its 100-year anniversary in the tire business. In the days preceding the 2016 election, the company's stock was worth a mere $27.79 per share. By the time Trump took office, share prices increased to $30.52. In the month that followed, Goodyear stock gained nearly 19 percent and traded as high as $36.29. Hasbro has a record of making profits look like child's play. The company's stock continues to rise under the Trump administration, jumping to a record level. The toy company started in 1923. First, it sold textile remnants. Then, it manufactured pencil boxes and other school supplies. In 2017, Hasbro has 5,000 employees working in more than 40 countries throughout the world. My Little Pony, Littlest Pet Shop and Transformers are some of the company's most-recognized and beloved toys. Hasbro earned more than $5 billion in revenue in 2016. In the month after Trump assumed his role as president, Hasbro stock shot up nearly 18 percent. But that doesn't necessarily mean Hasbro — or any other rising stock — is a great buy simply because of its recent track record. "Investors who may be looking to invest in stocks should do so if it makes sense in terms of their long-term financial situation and their goals," said Roger Wohlner, an Arlington Heights, Ill.-based financial writer and advisor. "Getting into the market only because stocks have done well in recent months is not a good idea. Timing the market is generally a bad approach that often ends poorly for smaller investors." So before you start investing, make sure you steer clear of bad reasons to buy stocks. IDEXX Laboratories provides cutting-edge veterinary diagnostic technology. The innovative company offers everything from portable X-rays for horses and other large animals to up-to-the-minute test results your vet can access via smartphone. The stock has climbed steadily since Trump's election. In the weeks following the vote, IDEXX enjoyed a nice rise. On Jan. 4, the company joined the S&P 500. IDEXX stock continued trending upward after Trump stepped into office. The company rose above $147 per share by March 1, an increase of more than 23 percent since Inauguration Day. If you've blown your nose, diapered a baby or wiped up a spill with a paper towel, chances are you've used one of Kimberly-Clark's products. The company sells brands like Kleenex, Huggies and Scott in more than 175 countries worldwide. Unlike many companies, Kimberly-Clark saw little change in stock prices after Trump's election. The $115.48 stock price of Nov. 8 moved little until Trump took office. Within days of Trump's inauguration, though, KMB stock rose to $121.79. The stock continued to rise, resulting in a nearly 11 percent increase to $134.83 a month since the president took office. However, the $150-billion Indian IT sector would have to take a serious hit to employ Americans, whose average annual salaries are way higher than those in India. Refusing to share details of the financial investment, an Infosys spokesperson told Mashable, "Our hiring across the globe continues to be in line with our business requirements." Meanwhile, NASSCOM, India's industry body for software and services companies, had expressed displeasure when the revised H-1B Visa Bill was tabled at the House of Representatives a few months ago. "The bill does not treat all IT service companies with H-1B visa holders equally, and the provisions are biased against H-1B dependent companies," it said in a statement. U.S. is the biggest market for Indian software companies. But the wave of protectionism sweeping the country presently doesn't augur well for Indian firms. Only time will reveal its true impact.